BK9954 wrote: My place is completely burned to a crisp, NO GRASS AT ALL to eat. I am on hay only. It's the worst it's been in 4 years. We had one up here back about then or a few years earlier. Lasted a couple of years. My water holes completely dried up and the buzzards had a field day. Lost a lot of fish. Only water was stock tanks. Everything eventually recovered. I live on Houston Black Clay and it showed it's colors. Had to watch where you walked as your foot would get caught in a crack and twist an ankle. Worried a lot about the bovines breaking a leg and having to put them down but none did. Before this last week there were a few cracks to watch out for. Pretty much puffed back up. Last edited by Texasmark on Mon Aug 20, 2018 6:25 am, edited 1 time in total. its been like spring here for the last month.. rains nearly everyday.. mist in the morning.. grass growing like its spring. 3rd cut should be really great. terrible for you guys in a drought, but I can't believe the rain we are getting here.. pretty unheard of in august. just ended up buying 4 pairs and a bull for 4500.00 .. lil rough but they'll get in shape for that price! ddd75 wrote: its been like spring here for the last month.. rains nearly everyday.. mist in the morning.. grass growing like its spring. 3rd cut should be really great. I have never seen an August like this. Cows are all loose. Might want to be sure you have good mineral out. That's dirt cheap compared to 2010 and 2011..
Yeah I remember $150 bales. The milo was cool when dove season came around, first year we had birds all over the property. I am still buying 5×6 coastal bluestem mix for $70 from Port Aransas right now as many as I can afford. I figure if this last I will be glad I did. I really don't want to sell what I have built up in my herd. Never got that high over here but was high enough. Of those prices I'd probably take the milo. Much heavier bales, cattle love it and force them to clean it up and there really is not all that much waste. TexasBred wrote: Never got that high over here but was high enough. 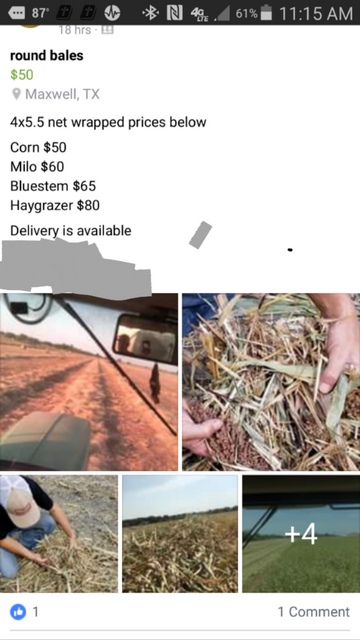 Of those prices I'd probably take the milo. Much heavier bales, cattle love it and force them to clean it up and there really is not all that much waste. During that drought Caldwell county was dead in the center. When I came out here, old man that's been out here about 50 years told me, " just so you know, Caldwell County is cursed when it comes to rain" said he was told that when he moved here, funny I have been watching go around us all year, rain just went up around Georgetown yesterday, seems like it splits around Lockhart like we are on the top of a Mountain sometimes. The only thing green on my place are the weeds and mesquites. This is along my creek. A round bale is lasting me half the time it was before, now it's all they have. I am feeding the hay I still have feom 2 years ago. Even where the septic tank empties out is dead.. I feel for you all. We were in that same situation here in SW OK back in 2011-2013, and we are still under drought conditions here. It got so bad we were cutting down cottonwood trees for the cows to eat. They would strip a big tree clean in no time. I don't think I received more than 2 inches of rain at our place in 2011 and into 2012. We had roughly 60 pairs back when I moved back here at that time. I sold over 100 cows and calves in 2011, and it wasn't enough. I think we have 2 cows left out of that original herd now, and they are going to the sale soon.